Nimble Streamer can be run all by itself and its behavior may be controlled via configs. However, WMSPanel provides controlling and reporting capabilities for Nimble to make the process easier. As described earlier, Nimble has rich caching feature set: disk cache for VOD streaming and RAM cache for live re-streaming. 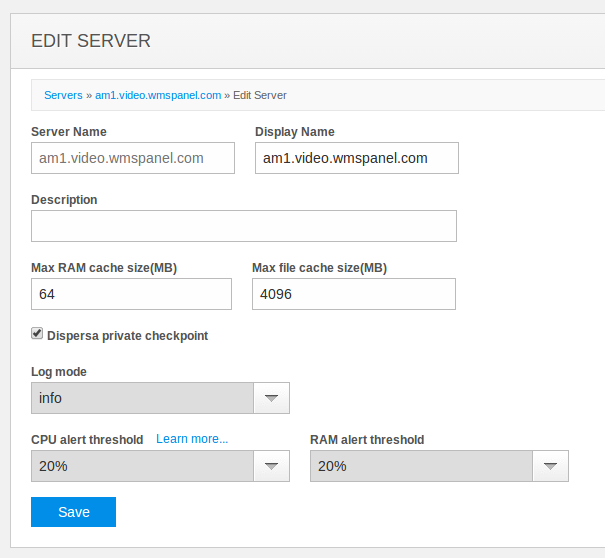 Now WMSPanel allows settings up cache size within its server control GUI. All you need is to go to Servers menu, select a server to control and click on Edit to see the form shown below. Editing Nimble Streamer instance details. As you see here you may also set up logging level to track Nimble activity. Logs can be found at /var/log/nimble/ directory. Other configuration options will be added to WMSPanel GUI for Nimble Streamer soon. one of checkpoints for Dispersa stream availability distributed checker. It also has RAM and CPU level alert set up to send notifications after reaching 20% threshold.